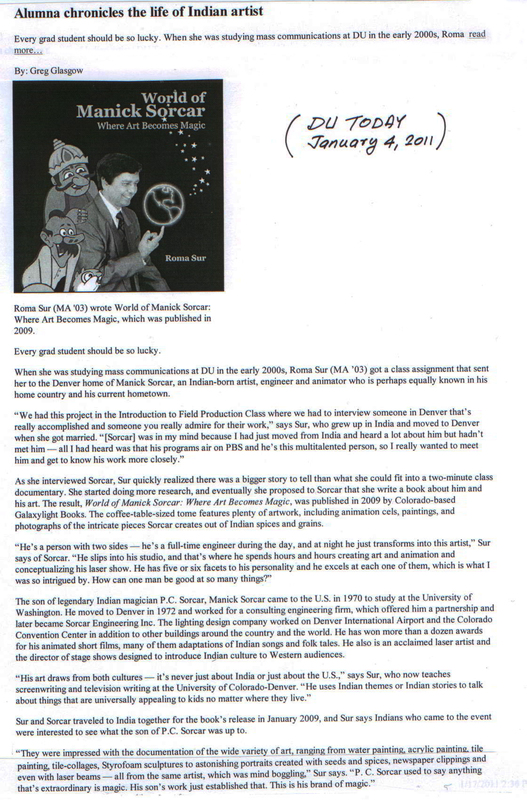 The interview-article was published in "DU TODAY", the official news magazine of Denver University, Denver, Colorado. Roma Sur, an alumna of DU and the author of the popular book "World of Manick Sorcar Where Art Becomes Magic" was interviewed by Greg Glasgow, Assistant Managing Editor of the University of Denver Magazine. The article is reproduced intact. 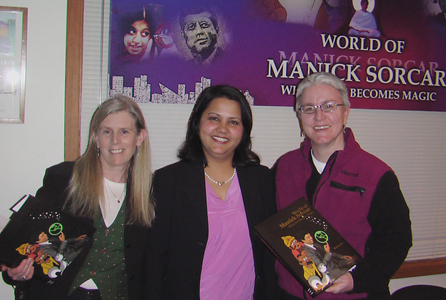 during the release of "World of Manick Sorcar Where Art Becomes Magic" (right). Every grad student should be so lucky. When she was studying mass communications at DU in the early 2000s, Roma Sur (MA ’03) got a class assignment that sent her to the Denver home of Manick Sorcar, an Indian-born artist, engineer and animator who is perhaps equally known in his home country and his current hometown. As she interviewed Sorcar, Sur quickly realized there was a bigger story to tell than what she could fit into a two-minute class documentary. She started doing more research, and eventually she proposed to Sorcar that she write a book about him and his art. 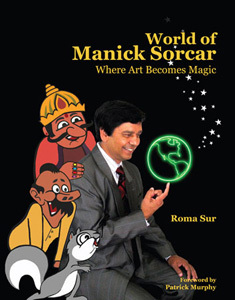 The result, World of Manick Sorcar: Where Art Becomes Magic, was published in 2009 by Colorado-based Galaxylight Books. The coffee-table-sized tome features plenty of artwork, including animation cels, paintings, and photographs of the intricate pieces Sorcar creates out of Indian spices and grains. The son of legendary Indian magician P.C. Sorcar, Manick Sorcar came to the U.S. in 1970 to study at the University of Washington. He moved to Denver in 1972 and worked for a consulting engineering firm, which offered him a partnership and later became Sorcar Engineering Inc. The lighting design company worked on Denver International Airport and the Colorado Convention Center in addition to other buildings around the country and the world. He has won more than a dozen awards for his animated short films, many of them adaptations of Indian songs and folk tales. He also is an acclaimed laser artist and the director of stage shows designed to introduce Indian culture to Western audiences. Sur and Sorcar traveled to India together for the book’s release in January 2009, and Sur says Indians who came to the event were interested to see what the son of P.C. Sorcar was up to.